This section is intended to contain items deemed of interest to Epigraphers: News items about discoveries and/or decipherments, comments by leading authorities, ancient alphabets, short articles (sometimes excerpted from ESOP), etc. Below, for instance, is a table of alphabets Buchanan is working with in his study of the alphabet used in the inscriptions from Glozel, a site on the farm of Emile Fradin, 20 miles from Vichy, in France. 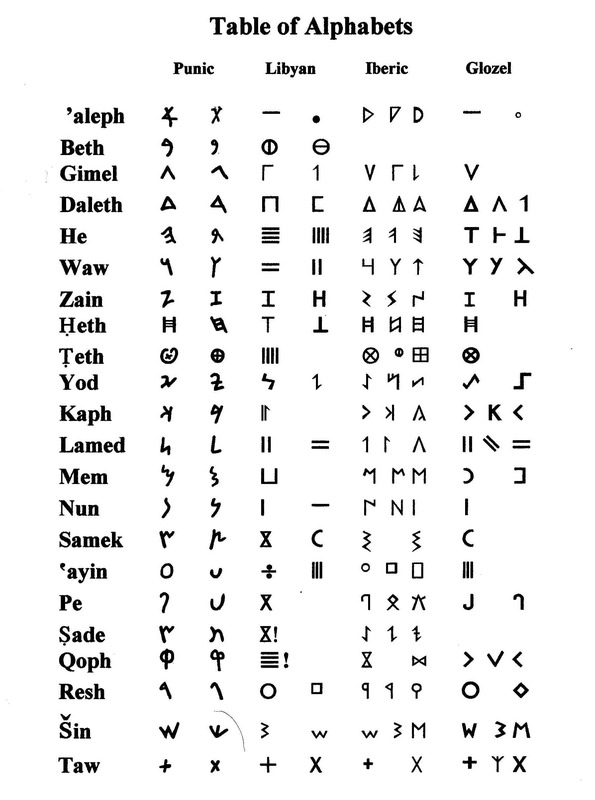 Note: Libyan used a convention wherein letters were written differently in horizontal as against vertical inscriptions (see Lamed and Waw, 'Aleph and Nun). Iberic characters are still under study. There are several 'S/Z' characters, for instance, but whether to assign them to Zain, Samek, (T)sade, or S(h)in is as yet problematical. The several known Iberic alphabets have yet to be clearly isolated from one another (see Buchanan's decipherments of Late, Southwest, and East Central Iberic in past issues of ESOP for three that have). The sound values of the Glozelic alphabet are still being investigated --by Buchanan on the one hand (in his Preliminary Decipherment published in ESOP, he surmised that Glozelic might be Semitic) and by Hans Rudolf Hitz on the other (published in Europe; he holds that Glozelic is Indo- European). Buchanan is very interested in Hitz' work and is studying it carefully. He has translated one of Hitz' works from the French and is working on others.